This walk will take you along Difficult Run between Colvin Run Road and Leigh Mill Road. This is a part of the Fairfax Cross County Trail. The trail is in good condition except for one very short sunny section where the brush slightly overhangs the trail. You may wish to be alert for ticks in this section. This is not a loop trail so the mileage has been doubled to reflect the need to return to the starting point. The directions have been written to cover walking in either direction on the trail and pictures are shown in both directions. The best starting point is from the parking area adjacent to the pumping station on an access road leading from Colvin Run Road at its intersection with Route 7 and Carpers Farm Way. There is a traffic signal at this intersection. From Reston turn left at the traffic signal on Route 7 and immediately turn right onto the access road. Follow the links and pictures marked east to walk that route. (East) The trail starts from the center of the eastern end of the parking lot. This is a gravel trail at this point. Do not take the trail to the right or south of the parking lot as it follows Difficult Run in the opposite direction. (West) This portion of the trail ends at the parking area adjacent to the pumping station. From here you can continue along Difficult Run on the Cross County Trail or take the Colvin Run Mill Trail to Lake Fairfax Park. If you started the walk from Leigh Mill Road you will need to retrace your walk utilizing the east directions above to return to the starting point. (East and West) The gravel trail is in excellent condition as it passes through the woods. There are no intersecting trails to worry about. (East) The trail intersects with an asphalt trail to the left and crosses Difficult Run on columns. The gravel trail continues on the other side of Difficult Run. (West) The trail crosses Difficult Run on columns. Stay straight on the gravel trail after crossing Difficult Run. The asphalt trail on the right leaves the park area. (East) There is a Cross County Trail marker about 90 feet after the gravel surface of the trail ends. Turn right to follow the natural surface trail up the hill away from Difficult Run. You are leaving the horse trail as it continues to follow Difficult Run. The horse trail becomes quite muddy in places after this point (see pictures) but is negotiable with some care. (West) The path rejoins the horse trail. Turn left to follow the horse trail. The trail has a gravel surface after about 90 feet from that trail point. (East) The Cross County Trail is somewhat narrower as it passes through the woods and homes can be seen on the right. The trail turns left and passes through a very short sunny section. The trail turns right and continues through the woods. (West) The path turns left and crosses a very short sunny section with some brush overhanging the trail. The path continues through the woods and turns right with houses on the left. (East) The trail enters the circle at the end of Brian Jac Lane. Turn left and walk along the grass along the other side of the private driveway to find the marker for the trail only a few feet from the circle. The trail turns left as it enters the woods, then makes a sharp right to continue down the hill. (West) The trail exits the woods adjacent to a private driveway. Turn left and walk a few feet to the circle at the end of Brian Jac Lane. At the circle look for the path marker on the right side of the circle next to the woods. Follow the path through the woods. (East) The trail rejoins the horse trail. Turn right and follow the combined horse/Cross County Trail. (West) A trail intersects from the left at a Cross County Trail marker. Turn left to follow the trail up the hill away from the horse trail. (East) The trail enters a meadow. The brush is mowed along the trail route at this location. (West) At the end of the meadow the trail enters the woods. 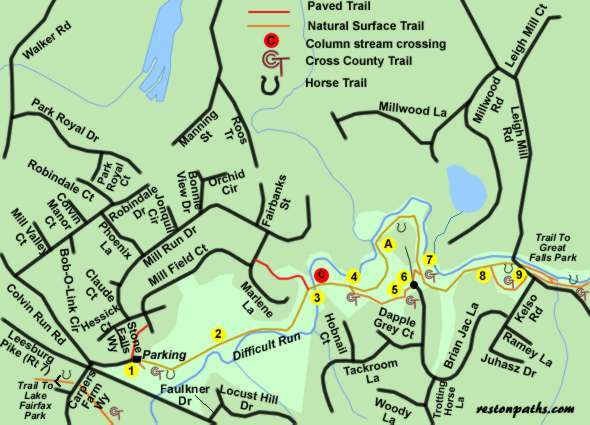 (East) The trail intersects with Leigh Mill Road next to a one way bridge over Difficult Run. The Cross County Trail continues on the other side of Leigh Mill Road headed towards the Potomac River. Return to the starting point of this walk over the route that was just walked. (West) The trail follows the cleared area of the meadow parallel to Difficult Run on the right. There is limited parking on the shoulder of Leigh Mill Road at the intersection with the trail. A sign indicates that this is Rameys Meadow Park. Follow the links and pictures marked west to walk the route from this point. You will be walking down the numbers from this direction.